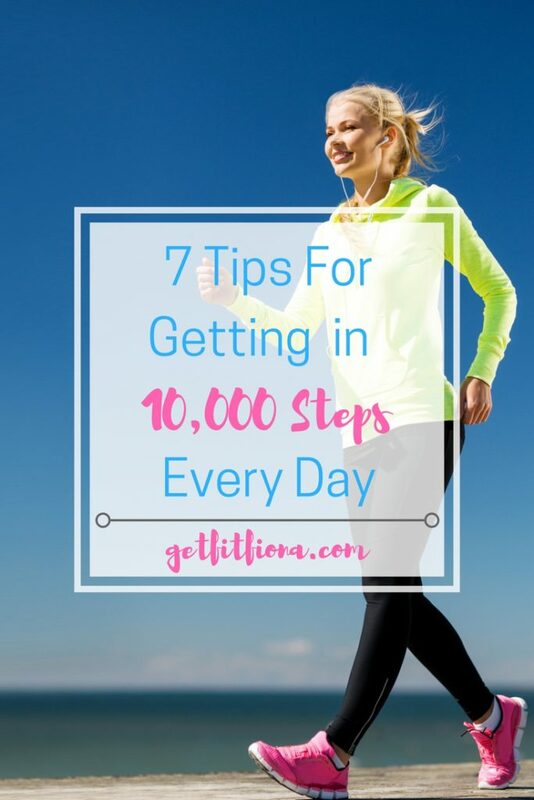 Today I thought I’d share 7 tips for getting in 10,000 steps every day. Go for a walk during your lunch break // While it might be tempting to keep sitting at your desk and browse Facebook and Twitter over lunch, consider going for a walk instead. Even 10 or 15 minutes being active is good for your body. Take the stairs instead of the elevator // It’s those little decisions that you make throughout the day that make the steps really add up. Simple changes like taking the stairs instead of the elevator will add steps to your total every day. Incorporate walking/running into your workouts // Add walking or running warm ups and cool downs to your workouts. Even though you might not be doing a cardio workout, those five minutes on either end of your workout will help get your total up to 10,000. Park further away // I used to be one of those people who would hunt down the parking spot closest to the store entrance. That’s slowly changed over the years though and I now purposely park further away from everyone else to get in a few extra steps. Do your errands walking, not driving // To build on the last point, if you have a walk-able neighborhood, or all your errands are close to each other, why not walk? Although the community I live in isn’t very pedestrian friendly, the bank, grocery store, and a few other places I go to often are all fairly close to each other and easily accessible on foot. Get on the treadmill while watching TV // If you’re anything like me and like to watch How To Get Away With Murder, make your time count and do double duty. I’m lucky enough to have a treadmill in the same room as the TV, so I’ve walked while watching TV before. You can even bring your tablet to the gym and watch shows that you’ve downloaded while on the treadmill. Go for a walk with a friend // Get in your social time while being active. Meet up with a friend at a park and walk while you catch up with each other. Schedule a play date at the park and get everyone moving, including the kids. Just in case you need some more motivation to get walking, I think the below video highlights a lot of the good health benefits of walking. If you think about it, it’s pretty cool that something so easy can make such a big difference in so many things. What’s your favorite way to get steps in each day? Great tips! I’m a huge fan of going for walks while at work, during lunch or other breaks I have during the day. There are some nice paths around my office and getting out for a little while not only helps me get steps, but it helps me clear my head.